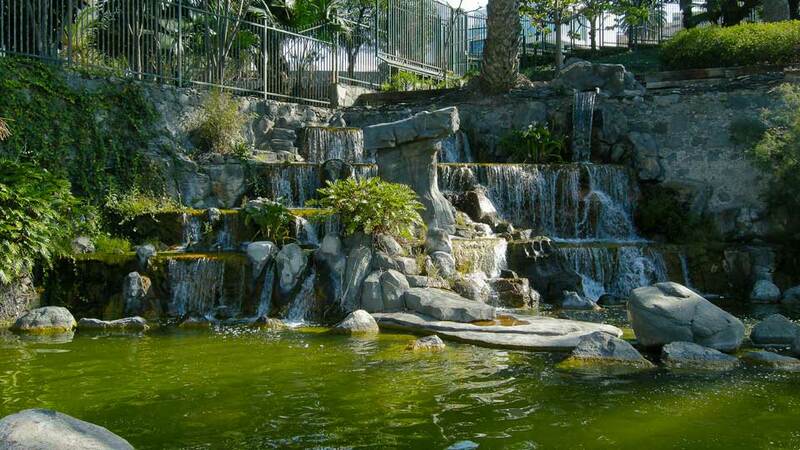 Doramas Park or Parque Doramas is the most beautiful urban park set in the capital city of Las Palmas, Gran Canaria. Thanks to the park’s cozy layout, child-friendly facilities, and lush environment, it has been a hit among families traveling to the Canaries in Spain. The park’s tree-lined gardens and lovely ponds are a home to certain endemic species of plants and animals. Its graceful fountains and waterfalls are like an oasis in the middle of a bustling district. With close proximity to a wide variety of activity spots, the park is definitely so much more than benches under shades of trees. Once upon a time, Doramas Park was envisioned to become a zoo, but things ended up differently as it was built to be a park. It’s named after Doramas, the legendary Guanche chief warrior, who is known for his bravery in fighting the Spanish colonizers. Today, his legacy lives on within the 47,000 sqm territory of the park. Jardin Canario, situated inside the stylish residential space, is far away from the noise of the city. To its west end is Pablo Canario, a lovely constructed village that depicts the typical Canarian neighborhood. It’s also next to the renowned Santa Catalina hotel, famous for its old colonial architecture. The park’s central location and its warm, quiet atmosphere make it an inviting resting place for passing tourists. 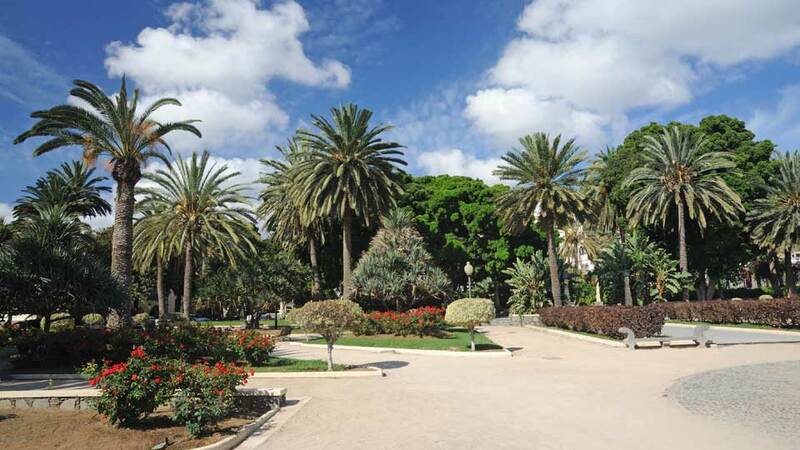 As one of the main attractions of Las Palmas de Gran Canaria, Doramas Park boasts of striking and serene features, with a mix of an oasis of green and water attractions. Guests can find solitude in its various lakes, waterfalls, fountains, and lush gardens. The abundance of trees provides shades for visitors and many intricately designed rock sculptures complete the picturesque sight. With a serene backdrop of trees, waterfalls, and lovely benches, the park has plenty of spots for those who want to jog, stroll, ride a bike, or just sit down and read. But that’s not all there is to it. The pond that sits near the entrance at Avenida Tomas Morales is home to most of the animals found in the park. Spot koi carps, frogs, and even swans wandering around the charming water feature. The place also comes with a tranquil landscaped area perfect for reading or just resting those tired feet. Here, it’s easy to get engrossed in a book while hanging out under the shades of dragon trees and palm trees. On some days, the music from the folk show in the neighboring Pueblo Canario can be heard from Rincon Oriental. A couple of interesting sculptures complete the landscape in Doramas Park. One particular piece shows a group of natives trying to escape their conquerors. Cascading waterfalls and fountains also abound, offering a Zen-like atmosphere that goes so well with the lush green environment. The playgrounds in the park are real magnets of kids. Two play areas, a smaller one for younger children, and a bigger one for older kids are filled usually on Sundays. Children could chance upon the puppet or a clown show usually at the auditorium-like sitting area. Need a quick dip? Hot afternoons are not a problem as the park is home to a small community pool. For a fill of refreshing drinks and typical snack like mojos, head to the small open air cafe near the pond, atop a huge staircase. Another worthy stopover when in the area is Pueblo Canario. Designed to depict a classic Canarian village with large houses, a town square, and a chapel, it takes guests back in time. Be sure to visit on a Sunday or a Thursday to enjoy the cultural show with folk dances and songs. While in the Canarian village, don’t miss out on visiting the famous Museo Nestor. Dedicated to the renowned artist and painter Nestor Fernandez de la Torre, its 12 exhibition halls are sure to take every art lover’s breath away. The museum opens on Tuesdays to Saturdays at 10:00-19:00 and on Sundays at 10:30-14:30. Inside the park, guests walk up the hill to get a fantastic view from the top overlooking the city through the Gospel Church. Nestled at the back of huge waterfalls, the hilltop and the glass-walled church are all feasts for the eyes. Doramas Park is located at Calle Leon y Castillo, Las Palmas de Gran Canaria. Strategically placed at the center of the city, it is near the Alcaravaneras beach, a favorite among locals. Another popular landmark nearby is Hotel Santa Catalina, a world-famous establishment in classic colonial architectural style. Just 20 kilometers from the International Airport of Gran Canaria, the park can be reached after a 20-minute drive via the motorway Autopista GC-1. For those coming in from the sea, it is a few blocks away in the west from the Las Palmas seaport. When in the city, anyone could catch a bus from the two main bus stations at San Telmo Park and Santa Catalina Park. Just take any of the buses and pay the standard fare to experience the tranquility of the park. Travelers may also opt to ride the many Hop-on, Hop-off buses that explore the many tourist sites within the city. The city of Las Palmas de Gran Canaria is popularly known for the old town of Vegueta, the urban beach of Las Canteras, and the various historical and religious sites. But not to be missed and carefully tucked in the uptown neighborhood of Jardin Canario is the subtropical Doramas Park. With beautifully designed waterfalls, gardens, ponds, and play areas, it’s a perfect place where families can get closer to nature. Offering quite a lot of alternative activities, a visit to this tree-lined path could easily fill up a whole day. It’s an affordable and relaxing way to jumpstart an exquisite vacation in Gran Canaria. Get acquainted with the island’s rich culture through impressive sculptures and engaging folk shows in the area. Or get a visual eye treat through rows of typical Canarian houses or through a museum full of thought-provoking paintings. No matter how we choose to experience it, one thing is for certain. Doramas Park is not a typical urban park.